Frustrated at the slow growth of your audience? Looking for ways to monetize your audio without sponsors? Considering quitting your podcast because of no ROI? Worried about investing too much time in your podcast? Being given lots of advice but no clear action? Lacking the digital skills that no-one told you you'd need? Looking for ideas on how to reinvigorate your podcast? Looking for someone to give you a specific, clear next step? Because to be a podcaster, you need to know more than just podcasting! The truth is, that to be a podcaster you can simply plug in your microphone and hit record. But to be a successful podcaster you need to be so much more: a marketer, a digital expert, a negotiator, a writer, an organizational genius and fifty other things! Podcasters who successfully monetize, grow and succeed know this and either spend the time hiring a team to do it or learning the skills that they need to do it themselves. As independent podcasters, consistency is everything and continually developing as individuals, hosts & creators is vital. But, we also have to focus a large part of our attention on bridging the knowledge gaps that we have as podcasters - learning the skills that we need to become audio influencers is vital to our ongoing success! brand your podcast for success from day one? rank highly in Google and other search engines with SEO for podcasters? increase your reach and influence? tip the scales when it comes to being the #1 choice for podcast sponsorship? consistently grow your email list with effective lead magnets? leverage the power of content marketing for your podcast? become an audio influencer and create a powerful, engaged & raving community of fans? monetize your podcast WITHOUT sponsors? The Podcast Success Academy was created by the team at Podcast Websites as a way of helping any independent podcaster to become a successful audio influencer in their niche. We work with independent podcasters every day; we're podcasters ourselves; we build podcasting software. We know the industry, what it takes to succeed and what the gaps are in podcasters' knowledge. 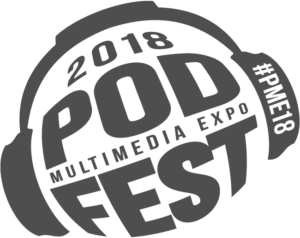 And we just really love the industry - the more podcasters succeed, the better it is for the whole industry - we can shape the future of media, together! Podcasting is so much more than talking into a microphone, and if you're sick of feeling behind because you're new to the 'digital world" then this is your answer. The Academy is able to teach you ALL the skills you need, past podcasting, so that you can grow, market, and monetize like the audio influencer you're ready to be. Get Free, Instant Access to the Academy! The "Audio Influencer Roadmap" - the complete map to becoming an audio influencer in your niche! Our library of completely free courses including The 7 Mistakes Holding Your Podcasting Brand Back and How to Fix Them! 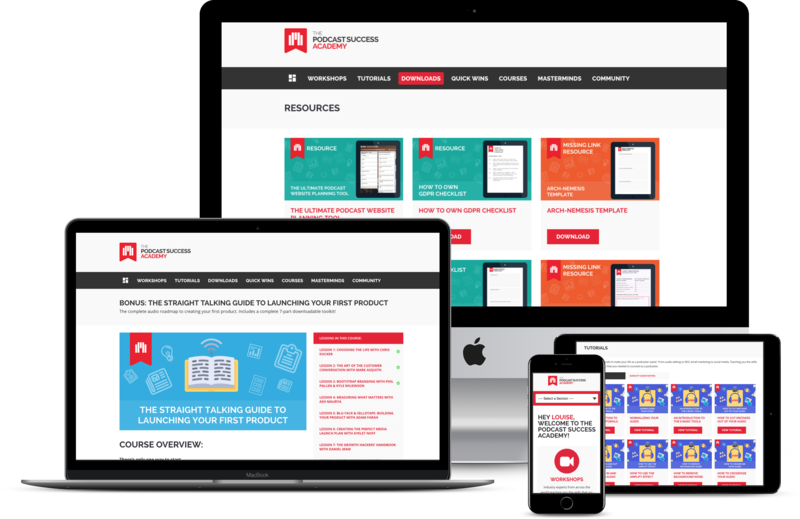 All of the free downloadable checklists, resources, templates and content upgrades that we create! Deep dive podcaster success case studies with actionable tactics to begin transforming your podcast from hobby to success, today! Weekly bonus content from The Guide to Audio Influence podcast by Jess Kupferman & Mark Asquith! Simple audio editing tutorials to help you to cut down your audio processing time! Selected expert workshops including workshops from John Lee Dumas & Michael O'Neal! Access to our thriving podcaster success community forums! Register Your Profile In 2 Minutes! Mark Asquith and Jessica Kupferman from Podcast Success Academy both brought enormous expertise and insight to our podcast conference here at Harvard. We can't wait to work with the Academy again in the future! I still haven't started my podcast, is The Podcast Success Academy right for me? Sure! Building your podcast is actually just the first step in being a podcaster! So many people start their podcast, build out some episodes and often even continue for months, years and beyond but never move past a hobby. If you want to become more than a hobbyist podcaster, then The Podcast Success Academy will give you the tools, knowledge and roadmap to set your show up for success from before day one! I don't want my podcast to be a "business" - why would I need The Podcast Success Academy? Hey, if that's what you want, that's cool with us! However, we often find that podcasters unexpectedly become businesses by virtue of building an amazing audience and then finding themselves with opportunities to help & serve that audience with their own products and services, or via sponsorships. Our free membership level gives you the chance to set your show up and start down the path of becoming an audio influencer right from the beginning, and means that you have the opportunity to "yes" to revenue when you're ready! Why is The Podcast Success Academy free? All ships rise - We like to make sure that podcasters are investing in the right places, and by being able to action the value that we give on the free tier, we believe that we can help the whole industry grow, even if podcasters never move up to a paid tier. This way, you can make sure you love our content before you invest a penny! From independent podcaster to audio influencer - Our goal is to help independent podcasters to become audio influencers in their niche, we created this free tier because we help Podcast Websites members to do that every day and wanted to give away our free content to every independent podcaster who needs it and regardless of them being a Podcast Websites member or not. Podcasting is for everyone, not just the tech-savvy - When we started Podcast Websites, we did so because we wanted to bridge many of the gaps in knowledge that new and veteran podcasters have. Our proven background in digital marketing, brand building and entrepreneurship includes a wealth of knowledge that podcasters aren't told that they're going to need. Is there a paid version of The Podcast Success Academy? Our free tier is available to any podcaster looking to grow, become an audio influencer or simply learn from podcasters with successful business backgrounds. Our paid tier includes more downloadable resources, tools, courses, community, expert workshops, weekly podcast coaching and much more and is there for any podcaster who is ready to make the next big move with their show. As a Podcast Websites member, we also provide one more level of content and support, including an exclusive mastermind group, podcast design options, exclusive courses, weekly office hours and more. Is this the same as a Podcast Websites membership? Can I get one-to-one support for my podcast? On the paid tier, you have complete access to a huge range of community feedback to help you, yay! If you're a Podcast Websites member, you unlock the highest level of Academy access which includes 24/7 support and one-to-one "Podcast Focus Sessions" with our team, led by James (our resident broadcast expert). The Podcast Success Academy is an extremely high-quality professional learning platform made up of indie podcasters, editors, and content producers where it’s ok to reach out and ask for help, or share successes. I look forward each month to participating in the exclusive webinars and training workshops. The Academy is a complete no-brainer for experienced podcasters who want to move into becoming an audio influencer, or for someone who is a complete beginner. Are you right for The Podcast Success Academy? Working with Mark and the team from day-one has greatly helped me to build my influence as a niche podcaster in the automotive aftermarket. I’ve implemented many of the strategies I learned from Mark directly. Knowing what is around the next corner can be a challenge for any new endeavor. Mark has always been there to offer insights, guide and coach my next moves. The Academy has been a game-changer and greatly accelerated my progress!